Brian Johnson, the lead robotics coach of The Kings and Queens, shared how the Monroe Robotics Program started. 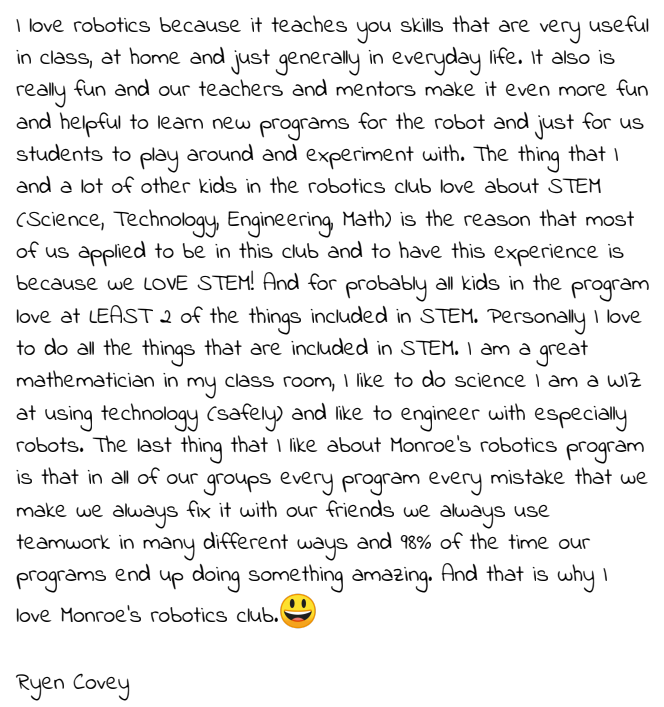 “As many of you know, we have been taking our robots out to our elementary schools and to community events for many years. Over that time we have had countless conversations with parents, teachers, local organization members, and school and district staff members about the FIRST Lego League (FLL) robotics program for 3rd through 6th graders. We have been trying for all that time to get FLL teams started at any of Monrovia's elementary schools but somehow, though interest was there, in the end, it just never came together. Until this year. In October we were invited to bring our portable demonstration field and robots to the Halloween Festival at Monroe Elementary. While we were there, we were approached by a Monroe parent who asked the same question we have been asked for years, "why isn't there a robotics program for elementary schools?" So we told her about the FLL program and how it works and offered to assist if Monroe was to move forward. She went off to confer with the principal and we assumed that would be the end of it, but a while later she did something no one had yet done before, she came back! And said they were going to make it happen. That parent was Tammi Rogers, and we shout out a big HUZZAH! of thanks and appreciation for her efforts. 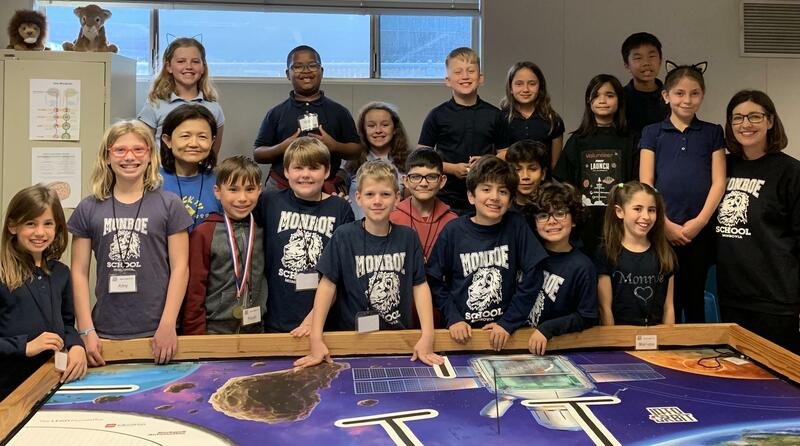 Because last Wednesday (February 6, 2019) after school, Monroe Elementary School held the very first session of their new FLL robotics program with 18 very happy and excited students on three different teams, six each for 3rd, 4th and 5th grades. Three of our team members were there, along with members of the Clifton Hippie Bots team. And we are working together alongside Tammi, Ms. Eva Kum, and other Monroe staffers to make the program a success. We were amazed by the enthusiasm and focus those young robotics enthusiasts show, and we predict big things will come out of their collective talents. 1. 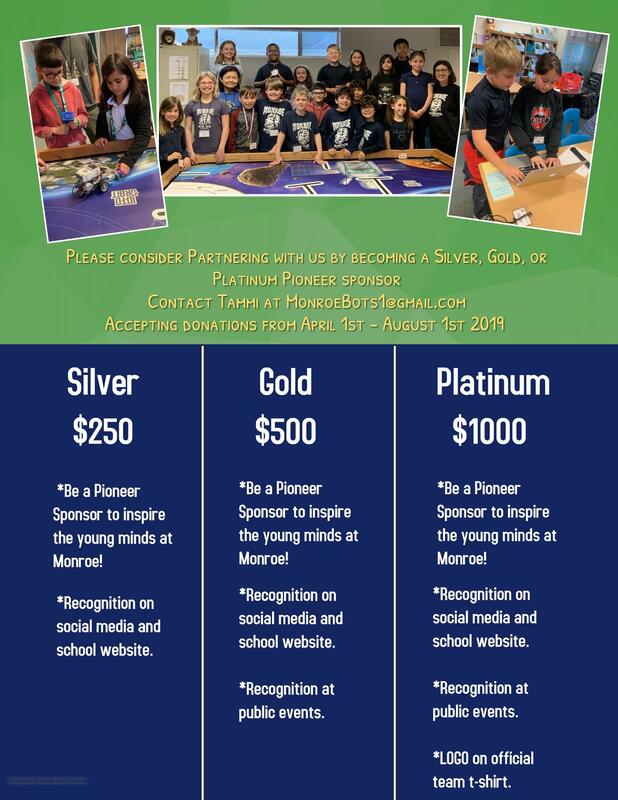 Complete the application process and return to Monroe elementary by the deadline. 2. NO EXCEPTIONS, applications received after the deadline will not be accepted. 3. 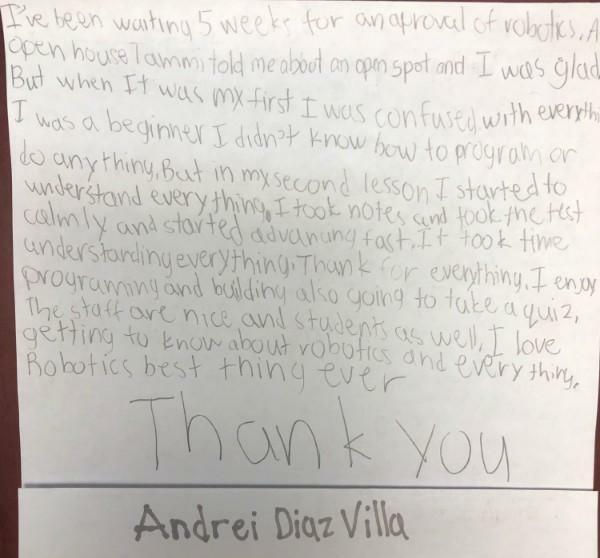 A submission letter from the student, this is a student application process, the students must reflect their words for applying to Monroe’s FIRST Lego League Robotics Program. 4. 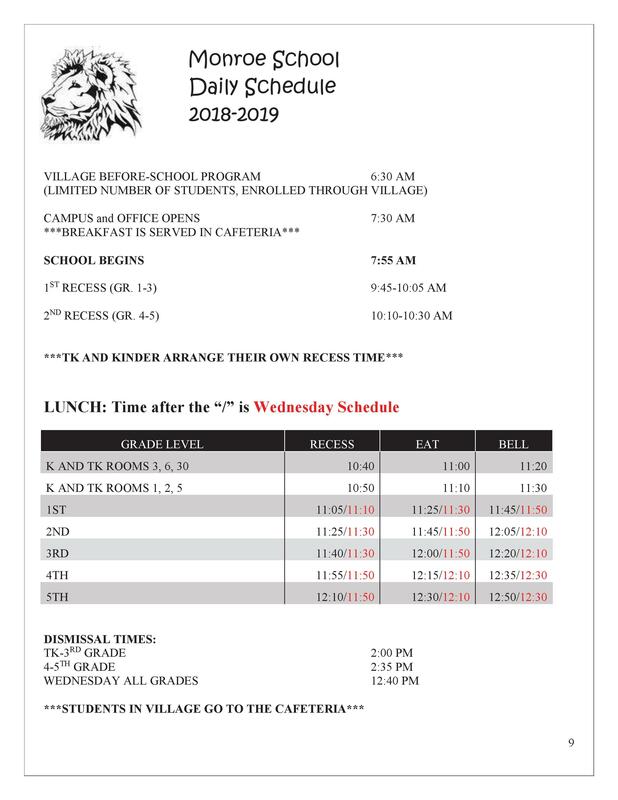 This After School Robotics Program will be on Wednesdays from 2:50 PM to 3 PM. 5. The applications will be reviewed by a selection panel based on specific program criteria. 1. Commitment to the robotics program; assigned homework is required to be completed prior to each session. 2. Seriously interested in a project-based curriculum that has study components, a team-based competition component, a software/programming component, and a building component. 3. Displays R.O.A.R (Respect-On Task-Attitude-Responsibility) behavior, committed attendance, and a true interest in STEM (Science-Technology-Engineering-Math). 4. If you have done some programming in a structured language, then you will likely do better than if you have not. Programming experience is not required to enroll, but it helps. 5. Creative students with problem-solving skills want to have fun learning! 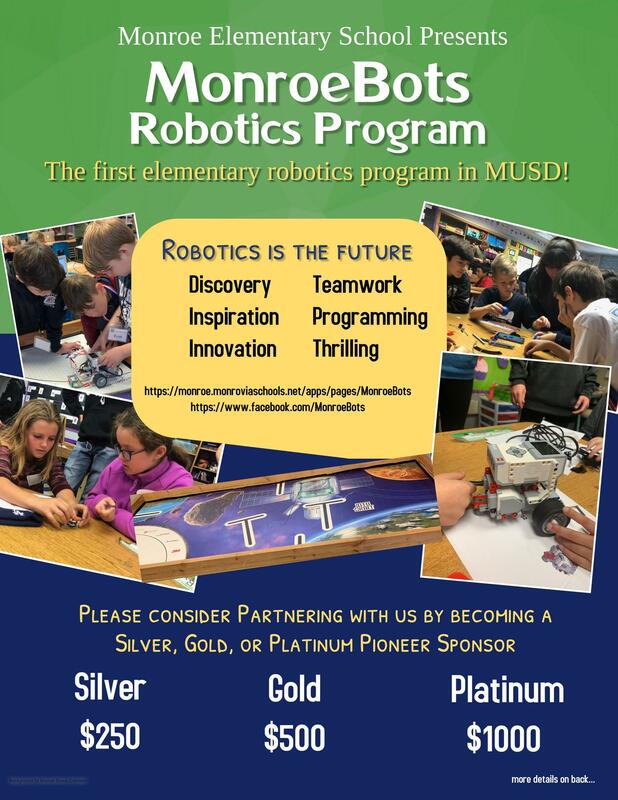 The 2019 Monroe Robotics Team, “MonroeBots” is an after-school robotics program with 18 students from third to fifth grade. 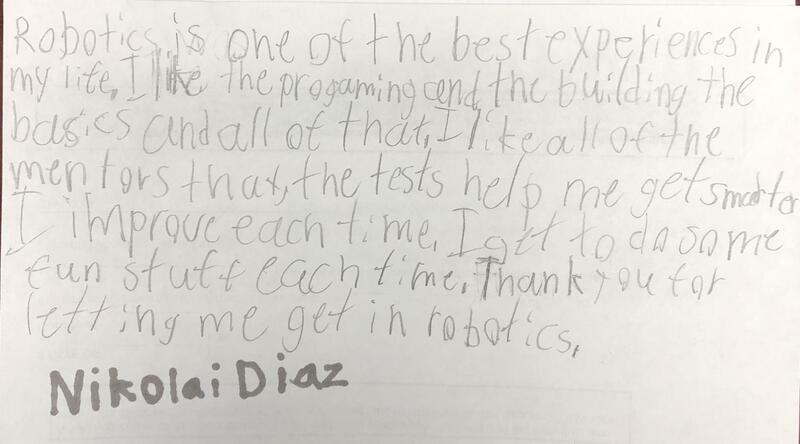 With sponsorship support, we plan to expand the program offering 18 new students the opportunity to engage “Into Orbit” with robotics. Our current teams will advance with the new FIRST LEGO League theme offering 30 students this experience for 2019/2020 school year. The expansion will also potentially offer these students two 12-week after school sessions for next school year.